The MD5 Hash Viewer also known as checksum for a file is a 128-bit value, something like a fingerprint of the file. There is a very small possibility of getting two identical hashes of two different files. This feature can be useful both for comparing the files and their integrity control.All hashing algorithms are one-way. Given a checksum value, it is infeasible to discover the password.Download the MD5 Hash Viewer now! The MD5 Hash Viewer of these files and compare them. ...... We simply have to calculate the MD5 hashes of these files and compare them. Act now, and experience the MD5 Hash Viewer utility for yourself, control your data! 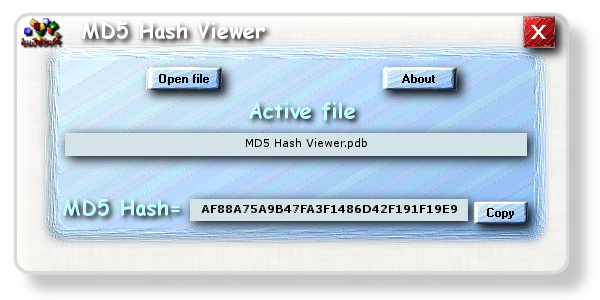 Download the MD5 Hash Viewer now! Qweas is providing links to MD5 Hash Viewer 2011 as a courtesy, and makes no representations regarding MD5 Hash Viewer or any other applications or any information related thereto. Any questions, complaints or claims regarding this application MD5 Hash Viewer 2011 must be directed to the appropriate software vendor. You may click the publisher link of MD5 Hash Viewer on the top of this page to get more details about the vendor.